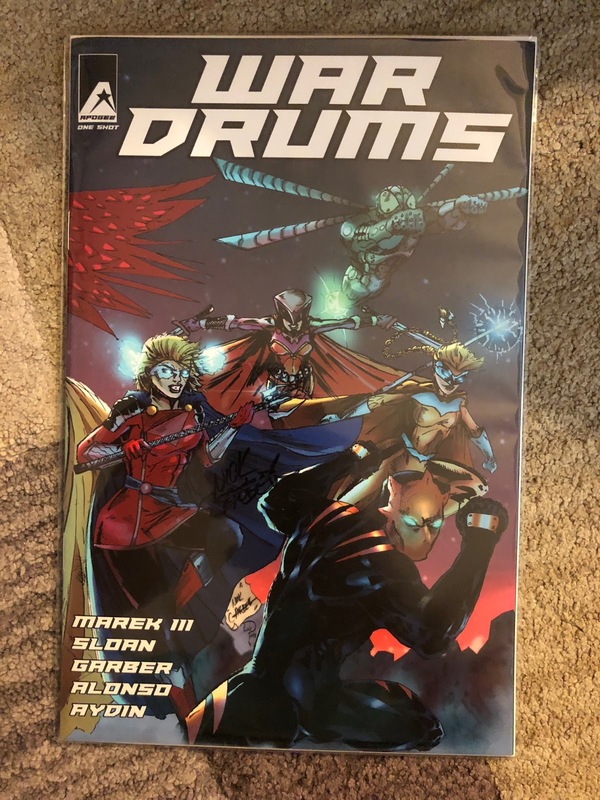 I had a fantastic time at this year's Saint Louis Mighty Con/Comic-Con when I attended on Saturday (I couldn't make it Sunday) and saw a variety of stupendous folk and picked-up some cool things too. I thought I would offer a summary of some of the highlights! 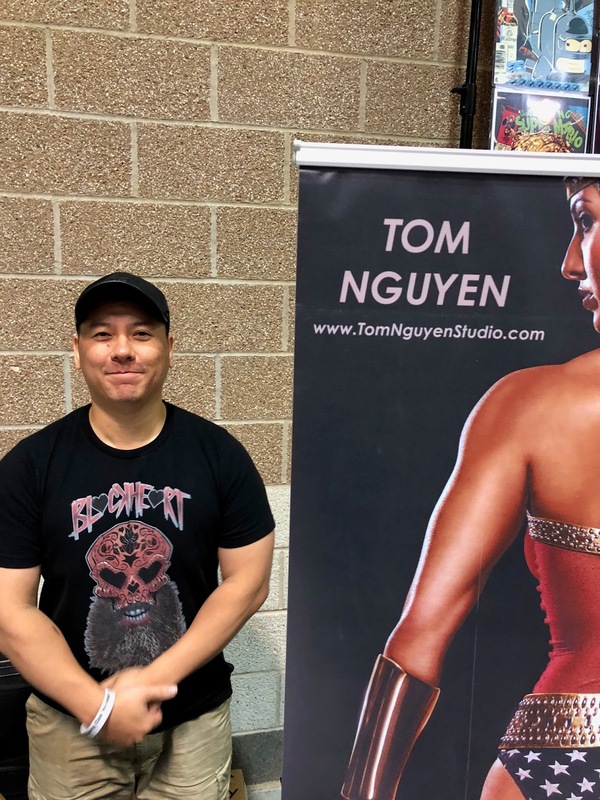 At the start of the show I had the pleasure of running into Tom Nguyen who I'd previously met before at a show. We chatted about a comic he had illustrated coming out soon titled, "The Switch," and how he had been busy assisting with concepts and design for the upcoming season of, "Big Brother," which premieres this Wednesday! After chatting with Tom I checked-out all the cool stuff being sold by retailers. I saw some cool Marvel Legends figures being sold by Space Monkey Toys, and then chatted with Bill of Ivie League Comics who had a slew of awesome books for sale. I then said hello to one of the big-name creators at the event, Jim Shooter, who had all kinds of cool stories about his years in the comic-book biz. 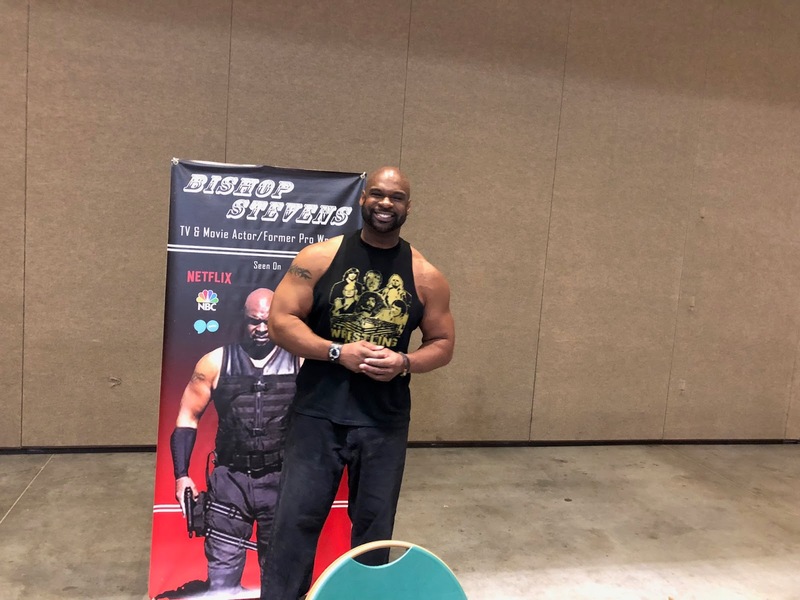 Next I ran into the always-friendly Bishop Stevens who was on hand to chat with fans of his work from when he was a professional wrestler and now as a an actor. I then spoke with author William Heinzen who told me about his novel, "Warrior of Light," which imagines the kind of world where the great evil of the story won. Following that I ran into Jim MahFood who I've spoke about on the blog before of loving the artwork of. He told me he was hard at work on the latest, "Tank Girl," comics that he was the illustrator for. I also said hello to an artist with an impressive display of works named Ashley Harp who thanked me when I told her how cool her stuff was. 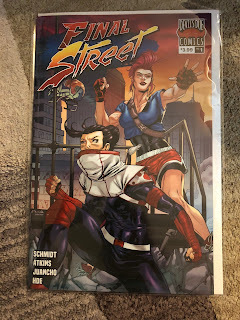 I saw Brian Atkins at the show and picked-up his new comic being published by Devil's Due, "Final Street," which he illustrated with Scott Schmidt as the writer and he told me was inspired by a mixture of martial arts movies, and classic video-games. I picked up a copy and look forward to reading it! 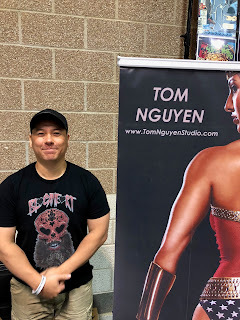 I also saw Timothy Bach of Moonrise Comics who created the, "Gargoyle by Moonlight," comic I reviewed a bit ago and is now hard at work on the series, "The Family Graves." Then I stopped by a booth featuring the work of Karen Swartz who had all kinds of delightful illustrations. I also saw another cool creator named Stephanie Gobby whose stuff was extremely impressive as well. I ate some lunch and then fittingly after eating ran into Chef Ryan Callahan who I had met at a previous con and enjoyed chatting with. 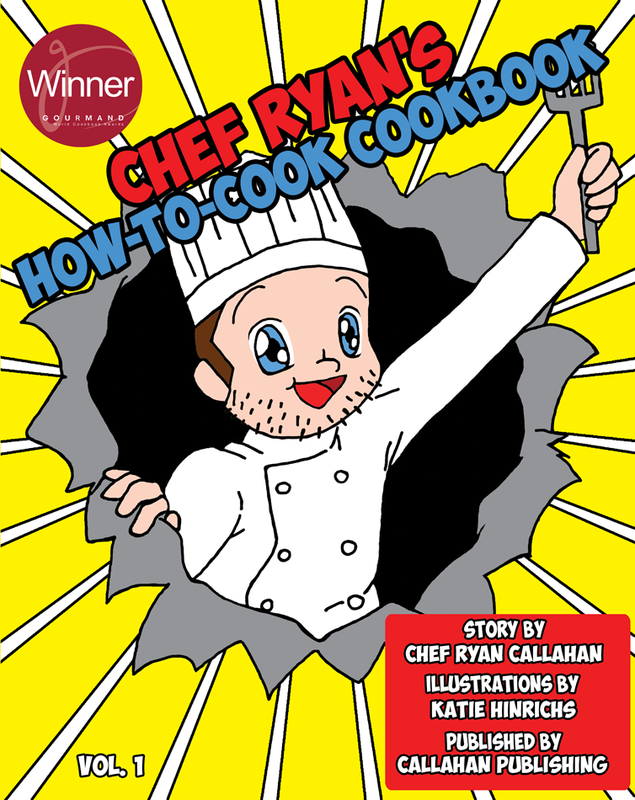 He of course is the writer of a combination comic and cookbook that has won a number of awards (with awesome artwork by Katie Hinrichs). I then interacted with USA Today Bestselling author Jay Noel who told me about his really cool assortment of books, including some with a steampunk focus! I also saw stellar illustrator and colorist Jeff Balke who had a bunch of cool stuff for sale. 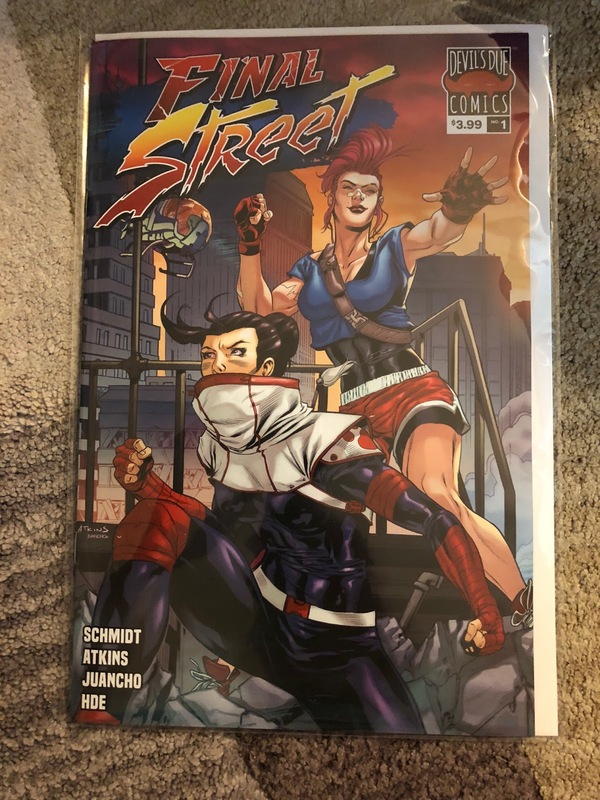 I bought a comic from the publisher Apogee Comics who had an assortment of exciting titles for sale. 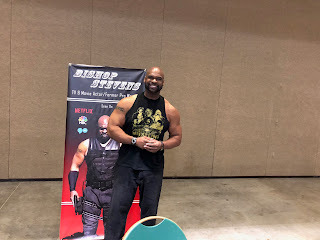 Also, as I finished touring about the show I met Jak Lore, an author who had released two urban fantasy books under his Mythic Legends Publishing Inc. brand. I looked around a bit more, picked-up some assorted comics and trades, then left for the day. This year's Saint Louis Mighty Con/Comic-Con was yet another fun time. Between plenty of retailers with comics, toys, Funko, and more there was a lot to shop for, and a wonderful number of creators from the famous to the lesser-known were present too. It also is a very reasonably-priced show, costing just $12 each day or $20 for a weekend pass with free parking--in other words, a weekend pass to this show is less than a single day at some other higher-priced cons! I would encourage everyone who couldn't go this year to attend the next show in 2019, and if you were able to come this time, I'll see you next year!